This season also marks the first spring training under no-longer-interim manager Pete Mackinon. While a lot of today’s drills were familiar, there were a couple stark differences. Pitchers threw from the mound to live hitters earlier than last year. And, they did this with the protective screens removed. Here are a few observations. The beginning of full squad workouts eliminates the necessity of deciding between the Complex with pitchers and catchers and Bright House with position player BP. But first, some photos from the last BP in Bright House on Monday. Quinn and Crawford around the stadium cage. Photo by Joe Kuhn. Charlie watching Quinn. That’s Mike Schmidt across from Charlie. Photo by Joe Kuhn. One of the easiest observations is the effect of the absence of Chase Utley. I guess the base running drills are not a activity where you want a player to pull a muscle. But, only Odubel Herrera matched Utley’s lost intensity. 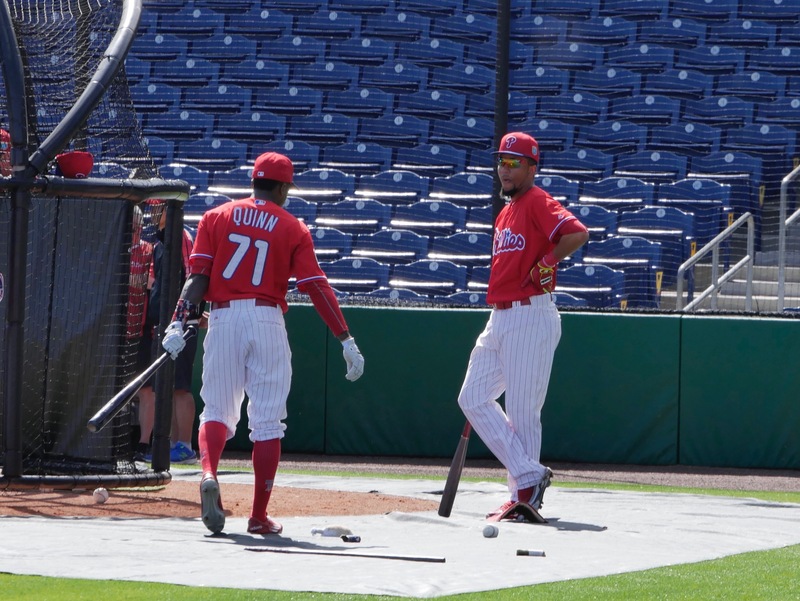 The infield drills were slightly different with all infielders rotating from second base to shortstop as they practiced fielding batted balls, flipping to the bag, and relaying to Ryan Howard at first. 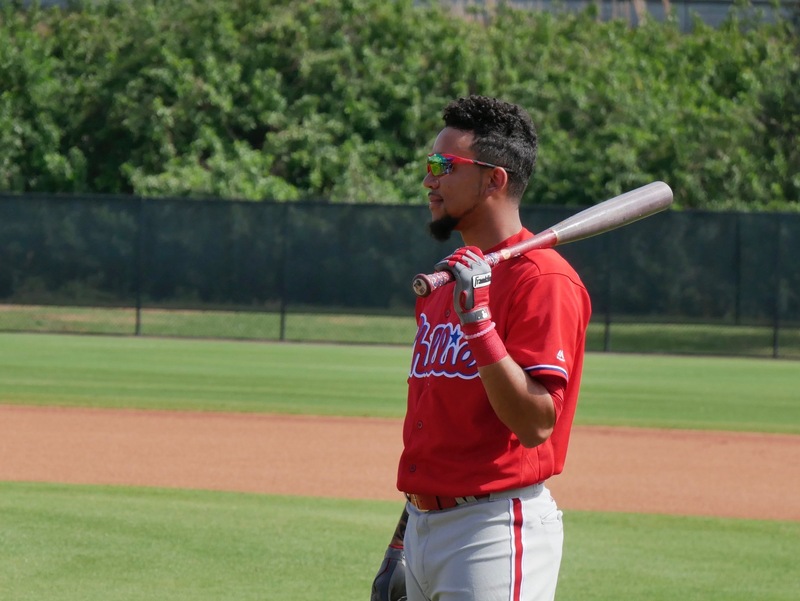 Cesar Hernandez, Freddiy Galvis, and J.P. Crawford all looked good at both positions as you would expect. Maikel Franco and Darin Ruf were respectable but clearly over-shadowed by Brock Stassi. The left-hander not only fielded well moving to either side, but also made his awkward pivot throws look natural. 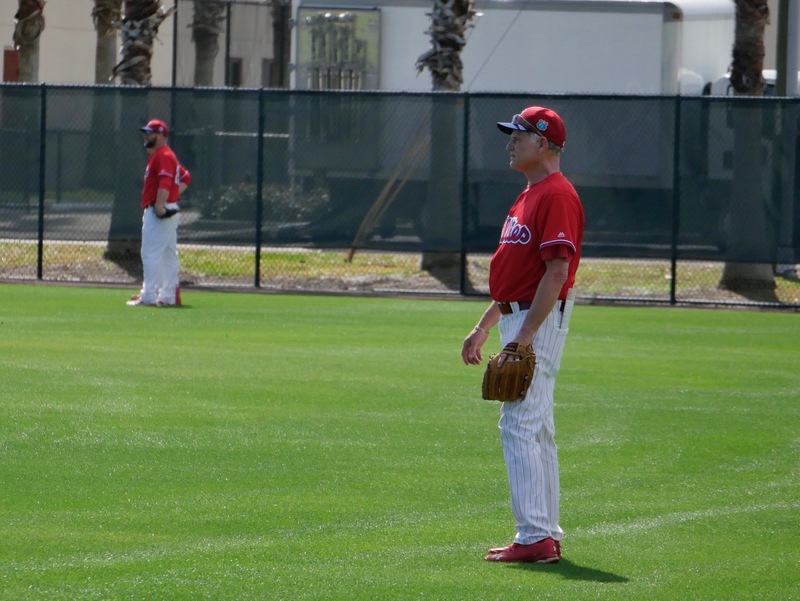 Note that Cody Asche was with the outfielders and Andres Blanco was running sprints with a trainer in left field. 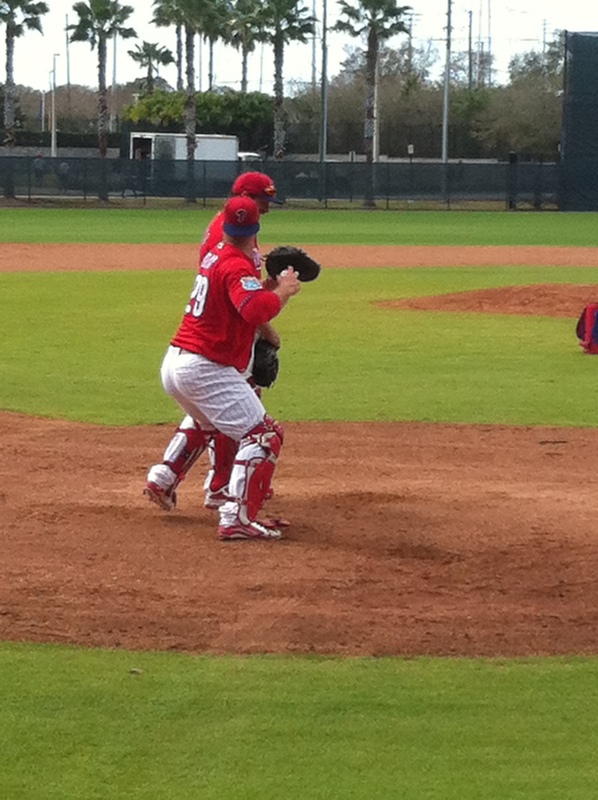 On Monday, the catchers practiced popping out of their crouch and throwing to second base. I noted that the order they followed was Carlos Ruiz, Cameron Rupp, J.P. Arencibia, Andrew Knapp, Jorge Alfaro, Gabriel Lino, and Logan Moore. After that they switched to throws to third with the next man standing in the batter’s box to obstruct the throw. 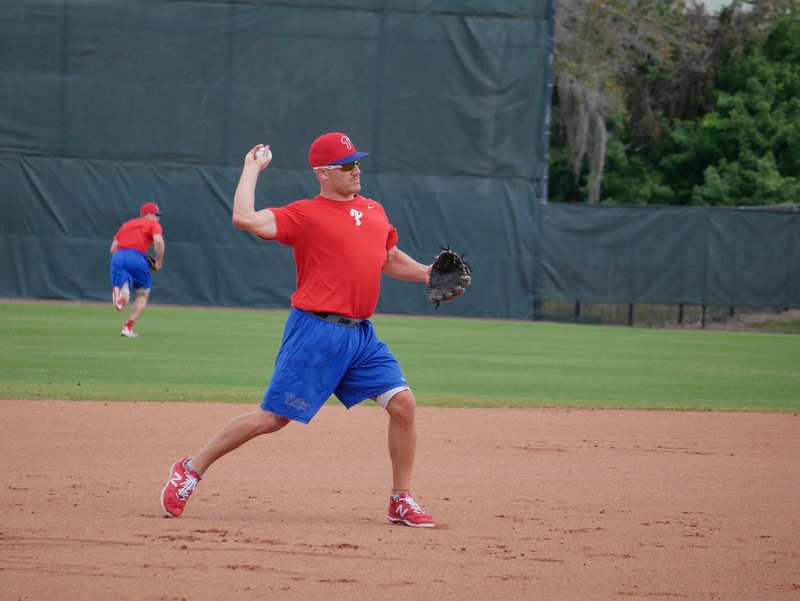 Coach Morandini played the role of infielder at both bases. Alfaro has every bit of the cannon arm we’ve read about. His throws to second had the least arc on them. His second to last throw to third elicited a word of dismay (?) from Morandini as he slammed the ball into the bucket and shook his glove hand. Alfaro threw the next ball even harder, on a line, no arc. Rupp throwing over Arencibia to third. 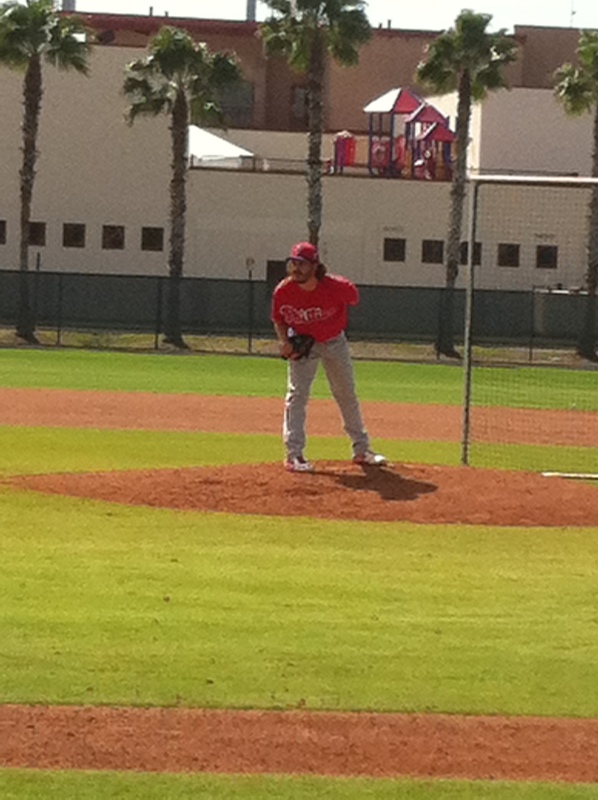 Alfaro during drills. Photo by Joe Kuhn. Back to Tuesday. The fielders and catchers separated into groups for PFPs. The group distinctions seemed clear. The group on Ashburn Field included Ruiz, Rupp, Arencibia, Knapp, Howard, Franco, Hernandez, Galvis, and Crawford. The other guys went to Schmidt Field. The PFPs included simulated bunts for the pitchers and catchers to field and throw to the designated base. The pitching group on Ashburn Jerad Eickhoff. 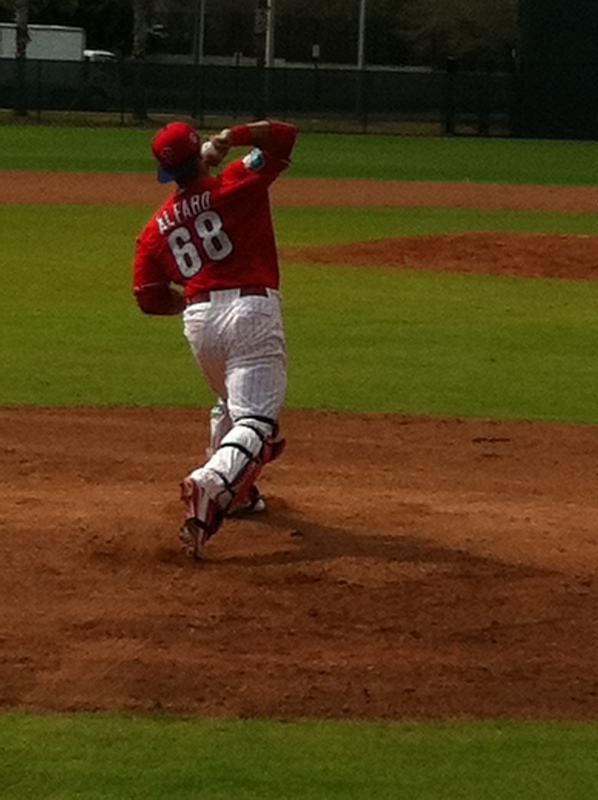 Unlike the other pitchers, Eickhoff pretended to throw a ball to the plate and pretended to throw to the correct base. Evidence that he is doing the drills but not throwing yet with his injured thumb. 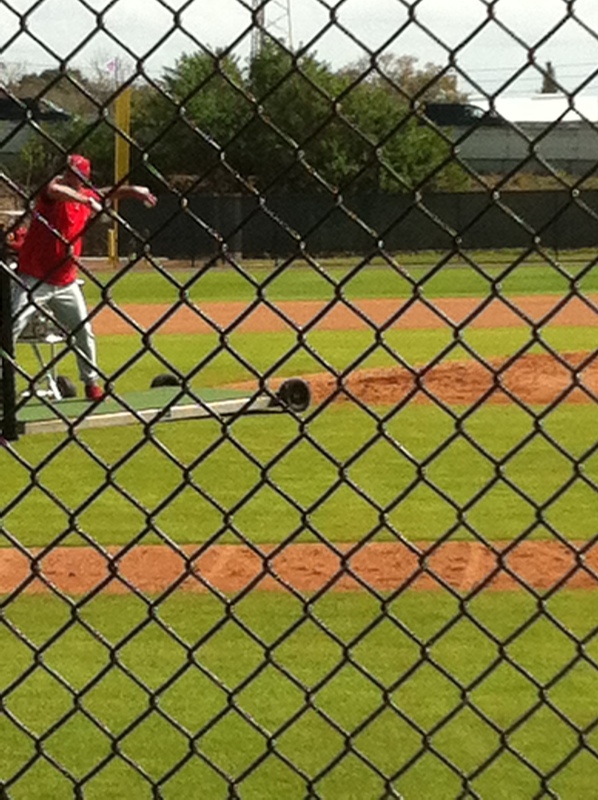 The day’s drills came to a conclusion with live BP against real pitchers, then BP Lite against their coaches. Later, while the early reporting minor leaguers were stretching, Roman Quinn came over to lay down 20-30 bunts from each side of the plate against a pitching machine. 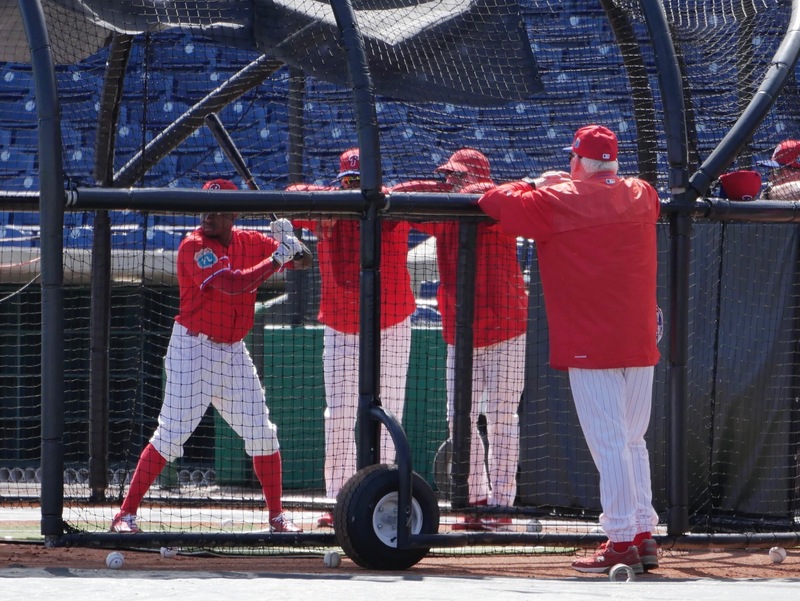 The Phillies latest outfield acquisition, Lawrence Andersen, shagging fly balls. Photo by Joe Kuhn. LaFromboise pitching live BP without the normal screen for protection. I didn’t see many of the pitchers using the screen. Unusual for the first day of ST.
A different view of LaFromboise with no protective screen. 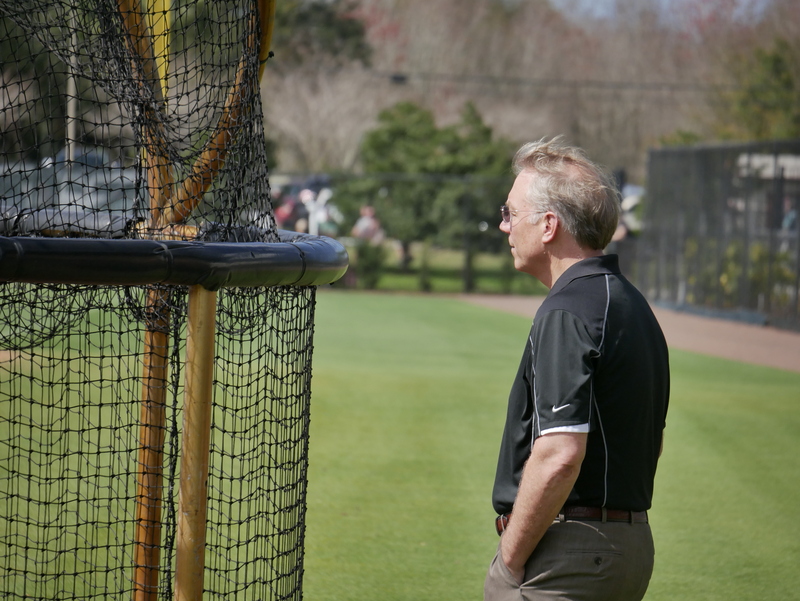 Andy MacPhail watching, just watching. Photo by Joe Kuhn. 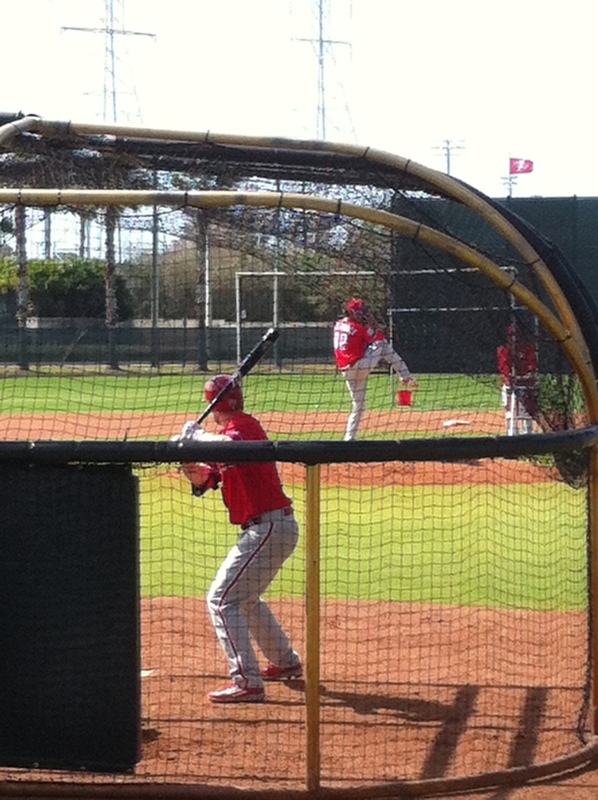 Aaron Nola (with screen) v. J.P. Crawford. Roman Quinn was part of the group with Crawford. Quinn got a couple of line drives off Nola while I was watching. 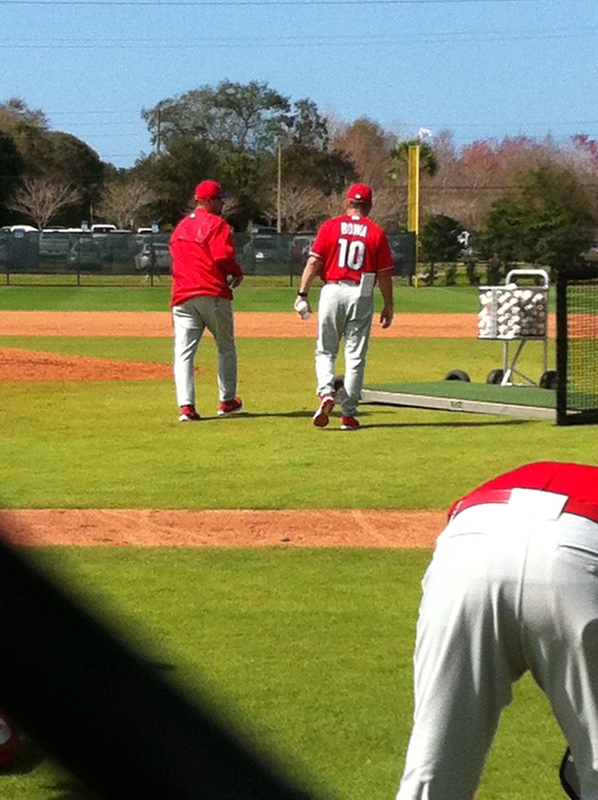 Quinn talking to the coach after BP. Photo by Joe Kuhn. Crawford waiting to hit at the Complex. Photo by Joe Kuhn. A new intern needs some sun screen on top. Oh, wait! That’s the new GM. Most coaches can pitch from the portable mound set directly in front of the dirt mound. 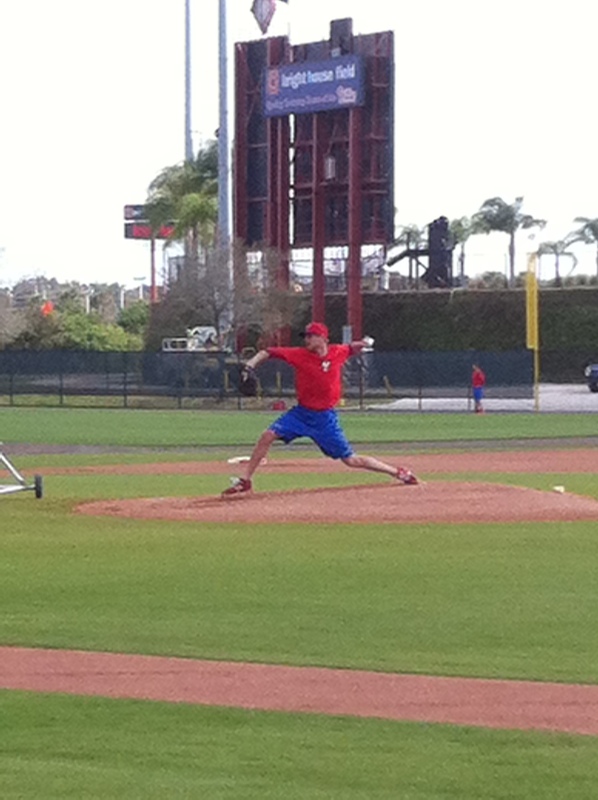 Coach Bowa to the “mound”. Notice how far in front of the dirt mound it is set up. I watched the Howard, Herrera, Franco group bat against Edubray Ramos and Larry Bowa. Ramos was throwing some heat and spun Herrera out of the box with a pitch up and in. All three hitters looked good today. Howard stroked most of his contact to left and left center. Franco muscled a lot of pitches that were beat down at the fence by a strong wind. Herrera just keeps hitting line drives. He put a few balls over the right field fence. I’m glad I don’t park there anymore. More numerology. Numbers 89 thru 92 were issued to spring instructors and a quartet of catchers who reported early and were helping out over the weekend. 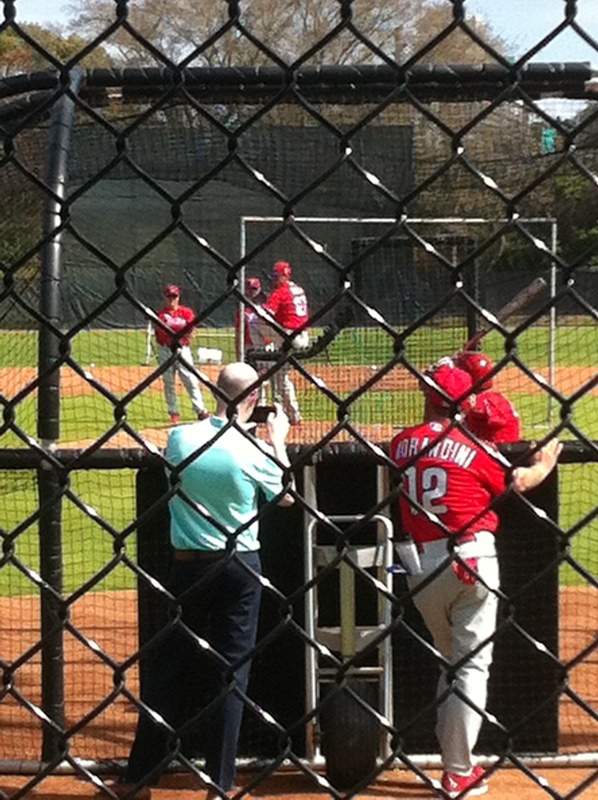 They were taking live BP over the weekend and drove us to distraction as we tried to figure out who was who. Monday, I figured out the four catchers were Austin Bossart, Greg Brodzinski, Edgar Cabral, and Joel Fisher. I’m like 90% certain. Maybe just 80%. 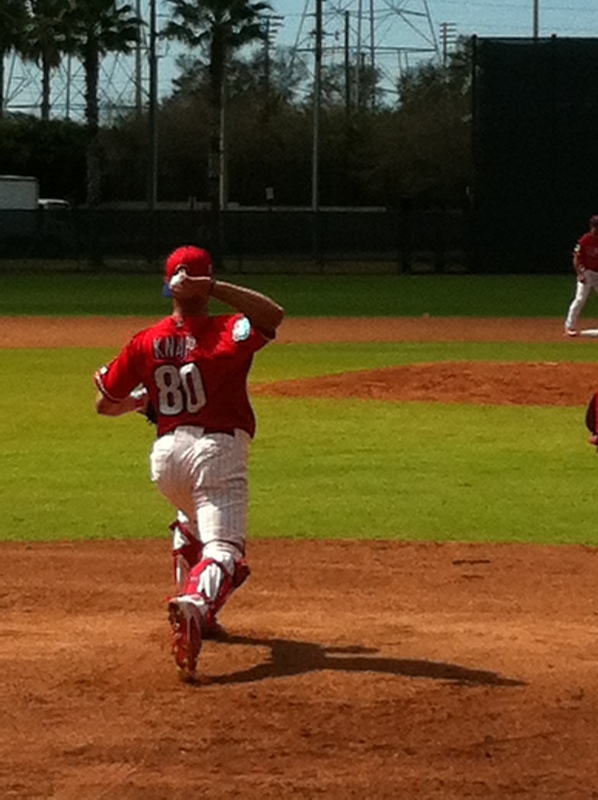 And some photos of the minor league early reports. Roly de Armas waiting for calisthenics to end. Photo by Joe Kuhn. Carlos Alonso making a throw from third. Photo by Joe Kuhn. Cody Forsythe on the bump. As I was leaving the Complex, I noticed Cody Forsythe was throwing on Ashburn Field. You can’t tell from this photo, but it appeared to me that Forsythe has altered his delivery a little. Looks like a different arm slot. Last season, his delivery reminded me a little of Jake Diekman’s delivery. Today, it appeared to me that his delivery was more three-quarters to over the top than I remember. No gun available, but his velocity seemed greater, too. 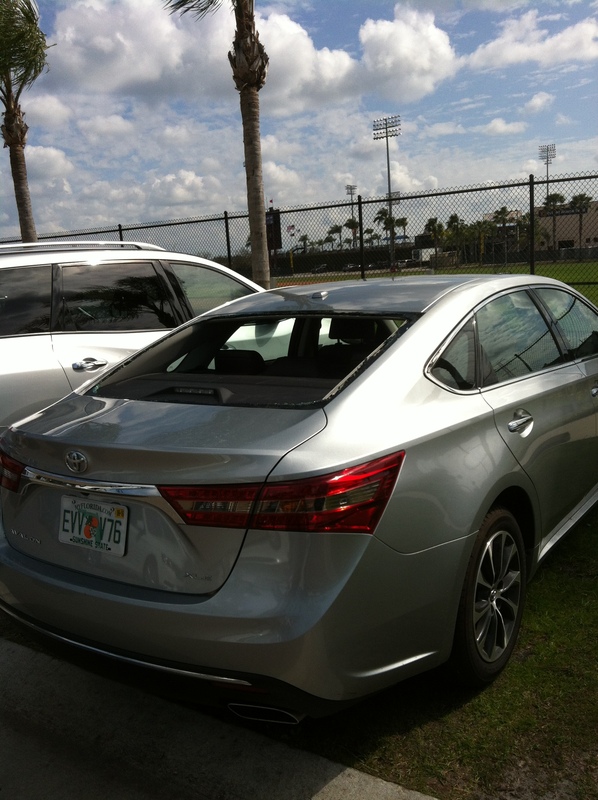 This car was parked in Doug Mansolino’s spot along the first base fence on Ashburn Field. The rear window was smashed today. As I headed south on Old Coachman Road, I passed “C” Randolph. He was walking on the sidewalk, carrying his Phillies’ duffle bag, headed to the Complex. I have no idea why he wasn’t walking within the fences of the Complex between the parking lot and the club house. I almost drove off the road rubber necking. That’s another young prospect in camp early. Doing your best to make us feel that we are there. Thanks. Good work. And why does Doug Mansolino have a reserved parking spot? So many questions, but such a good write-up. Greg Brodzinski. 18th round pick in 2015 out of Barry University. He put up a combined .326/.340/.370/.710 in 50 PA between the GCL and Williamsport. 30% CS in 20 attempts. Either Mansolino works at the Complex year round or parking spots are being reserved for minor league coordinators. In January 2014, he was elevated from minor league infield coordinator to minor league field coordinator replacing Mike Compton. In November 2014, he was among the 5 minor league coordinators who were extended along with Andy Tracy (hitting), Chris Truby (infield), Andy Abad (outfield/baserunning) and Ernie Whitt (catching). Mansolino has coached 29 seasons in the pros, including years in the majors with the White Sox, Milwaukee, Detroit and Houston. Mansolino is responsible for every minor league coach and every minor league player plan. I guess that warrants a parking spot when he’s in town. I always appreciate your reports. I’ve been to training every day and I can’t wait to read about what and who I was watching. Tuesday we stayed in one place and were able to watch both fields. Keep up the good work! Great stuff Jim, thanks! Really make us feel like we are down there watching. Planning to come for a spring training for a weekend three weeks from today. Can anyone recommend a hotel close to the Complex? Also, some restaurants where Phillies fan would gather? There are several hotels close by, next to Lenny’s, everybody’s favorite breakfast spot. There’s a Hampton, a Magnuson, and several others. Lots of restaurant choices, some in Clearwater, some in Clearwater Beach. I go to Island Way Grill and Columbia each year but I used to go to other good restaurants down by the beach also. First – thanks so much for the workout reports – I love them. Hearing about it takes you away to another – much warmer and happier – place. I heard about Lenny’s for years before I finally went there and it’s worth the wait (it’s about a minute or two drive from the complex) – but you probably will wait – probably between 20-45 minutes. There are a lot of hotels, a few close, but many within about 15 minutes. I always go to Columbia restaurant (Cuban) – the original is in Tampa and worth the trip for the great mosaic tile – the other locations are fine too. By the way, I am coming down for the extended weekend of March 24-27 – this time with my wife (who promises to sit through some extended prospect workouts – we’ll see on that one). If anyone is going to be there, please let me know – I tried to meet up with Jimmy last year when I was with my son, but we didn’t connect. This year, I intend to wear my throw-back Mitchell & Ness , 1936 Chuck Klein Jersey at the practice facility so people can’t miss me if they want to locate me and chat. This year, rather than going hog wild and doing PP road trips (not that it’s a bad idea, it’s just biting off a lot for a first go0, why don’t we try to have a PP night/day at the Reading Phillies and/or a PP night/day at the IPigs? I looked into this a few years ago, but life intervened. Let me know if folks are interested – and be nice to my wife if you meet her – I’m going to enlist her help and, if I ask her to help and she’s up to it, trust me, it will happen. Thank you, Catch, but I was planning to go there a week earlier. Would love to meet though. It sounds from the voting (unexpected thumbs down votes) as if folks are not interested in a getting together for an outing to Reading or Lehigh Valley – if that changes, let me know. Otherwise, see you at Spring Training. Thanks Jim, great stuff. How did Knapp’s arm look? 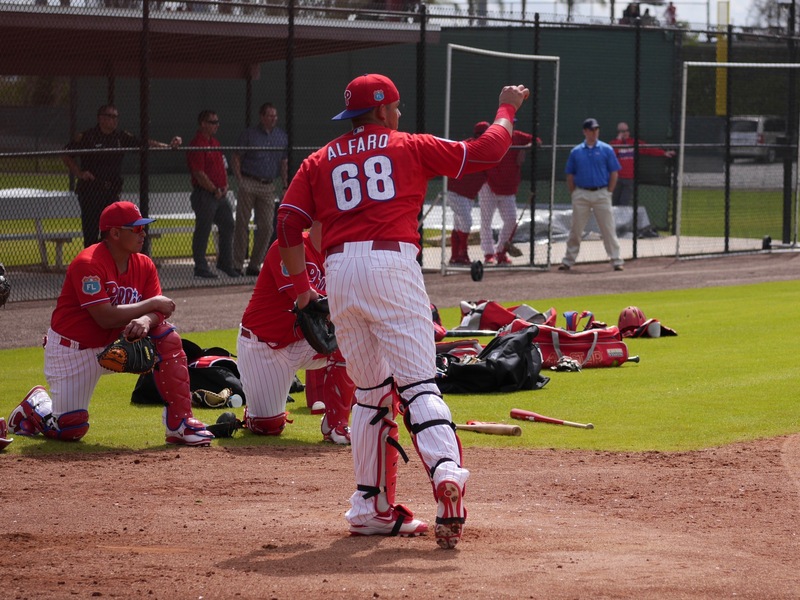 A couple drills are a very small sample size, but I thought his arm looked fine …until I saw Alfaro’s arm. How does Franco’s body look? As a prospect who has had several outlets say that he could easily develop into a “bad body ball player”, I am curious to know how in shape he is. Especially waiting until the absolute last minute to report. So many things about him are exciting, yet something in my gut tells me he is going to be a real pain in the rear. That’s an odd question, buddy, for this kind of site, don’t you think? Thats an odd reply coming from the SALAMI GUY…. He looks just he always has and performs just as I remember when he was in Clearwater. Slow home-to-first in the running drills, but better home-to-second and first-to-third; soft hands during the drills where he fielded balls at second and shortstop; strong arm on the relay throws to first; and lots of contact and power at the plate during BP. He had to contend with a strong wind in from left, and tried to hit some balls through it, most of which would have cleared the fence under normal conditions. He probably got a little too much air under several fly balls, but who’s going to nitpick on the first day of camp. I really look forward to these reports every day, thank you Jim. Catch, I am in. Reading or LHV, either one would be a great outing. Is there a ‘Safelite’ office located outside the parking lot? 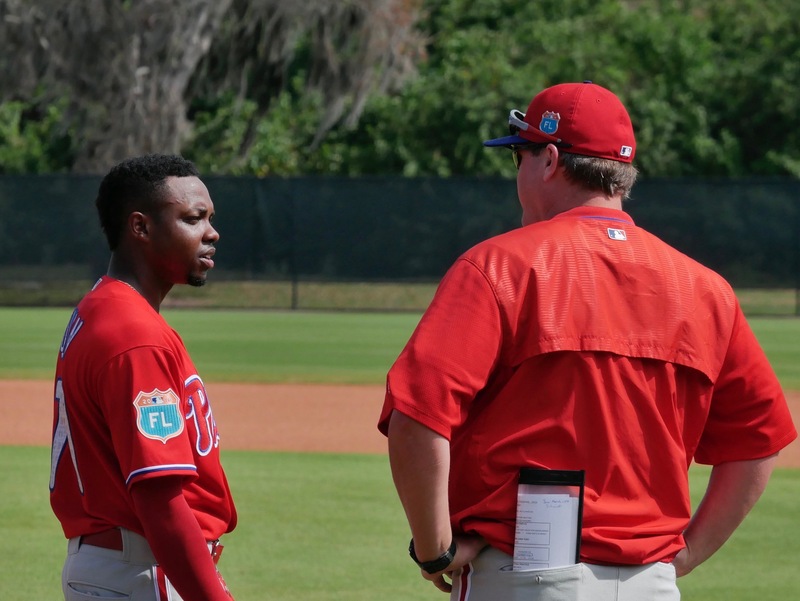 There are some who still think that Odubel Herrera will move to secomd base in the future when the other top OF prospects, like QUinn, Williams or maybe even Cozens are ready for MLB time. Jim Salisbury’s article today on Herrera and possibly LF or CF. Any inter squad games scheduled?